PROVAUNT is a powerful new product for the control of Argentine Stem Weevil (ASW). PROVAUNT directly targets and destroys both ASW Larvae and Adults, providing a tool that can stop the life cycle. Superintendents that have to manage ASW know how difficult control can be, especailly because there are a number of life cycles present at any one time throughout the summer. 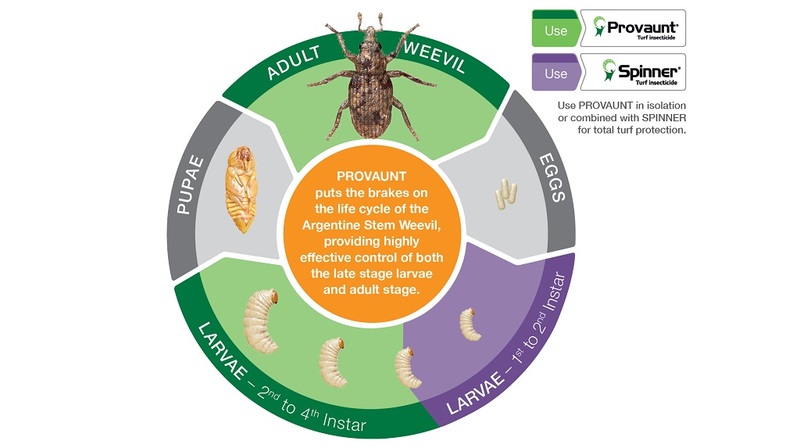 PROVAUNT will control the Adults and Larvae, especially the very damaging and hard to control 3rd and 4th instar. PROVAUNT contains Meta Active technology, which when ingested by the insects leads to paralysis which stops feeding leading to control of the insect. It is translaminar, which is highly relevant, as it lodges in the cells of the turfgrass plants where it is ingested by the insect. Importantly, PROVAUNT will also control all stages of ASW on contact. PROVAUNT allows turf managers to reduce their use of Organophosphate technologies and Synthetic Pyrethroids, which anecdotally are not providing the control that they once did on ASW. A new mode of action has led to new application techniques, with local research and development demonstrating that the best results are achieved when PROVAUNT is not washed in. Applied at the low rate of 1.25 kg/ha, making application not only more effective but easier to apply. PROVAUNT is available in 500g containers is an easy to use WG (water dispersible granule) that dissolves when mixed with water. So, what is the PROVAUNT effect? The PROVAUNT effect is that we can now successfully control ASW Adults and late stage Larvae in one application. When used with SPINNER to systemically control 1st instar Larvae, superintendents can control all damaging stages of the ASW life cycle, knocking ASW over like dominoes, in a program that can be trusted to deliver consistent control. At Syngenta we know that turf management is not just passion, it’s science. For more information regarding PROVAUNT please contact your local Syngenta Agent or Syngenta Territory manager.